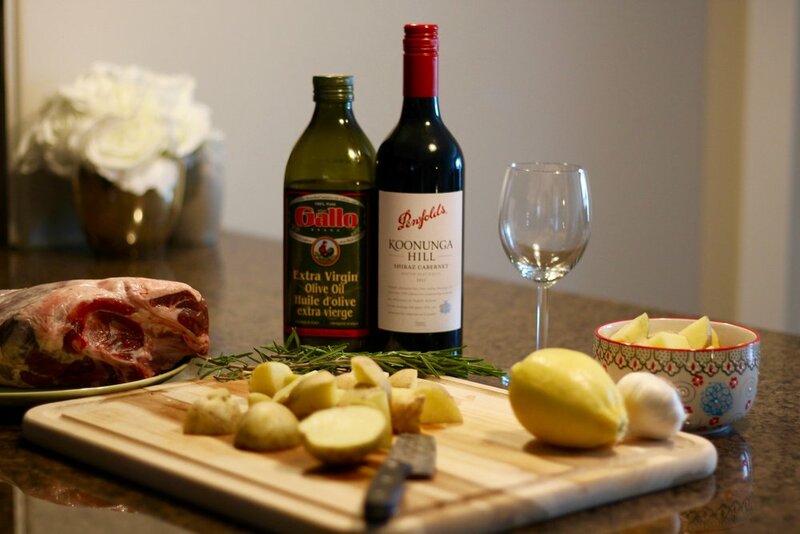 Easy slow cooker leg of lamb with red wine, whole garlic cloves and rosemary. This is an easy recipe that creates a dish worthy of Master Chef and is perfect for week's worth of versatile meals! Grab a handful of ingredients, a delicious bottle of your favourite red and dust off that slow cooker to create what will no doubt become a household favourite! I am so excited to be able to share my passion for cooking and experimenting with flavour through the blog. I have always loved to cook, a tradition that was passed down as a result of a childhood spent with my mother in the kitchen. My Nigerian background revolves around coming together for a meal and expressing love through the simple act of asking "have you eaten yet?". My mom is a master chef, a woman capable of throwing together the most unlikely ingredients to create a meal chuck-full of love. As you know, I was blessed enough to grow up across the globe, and my palette has evolved to reflect this. My mom's cuisine is an interesting mashup of Nigeria & middle eastern cuisine with splashes of European flare, a direct reflection of where she raised my siblings and I. This not only means a ridiculously mature palette on my end, but ensures that I can play with combinations of tastes and flavours without fear. So, it is my goal through this new section of the blog to share my passion with you and inspire some out-of-the-pot thinking (see what I did there?) when it comes to those culinary feats! 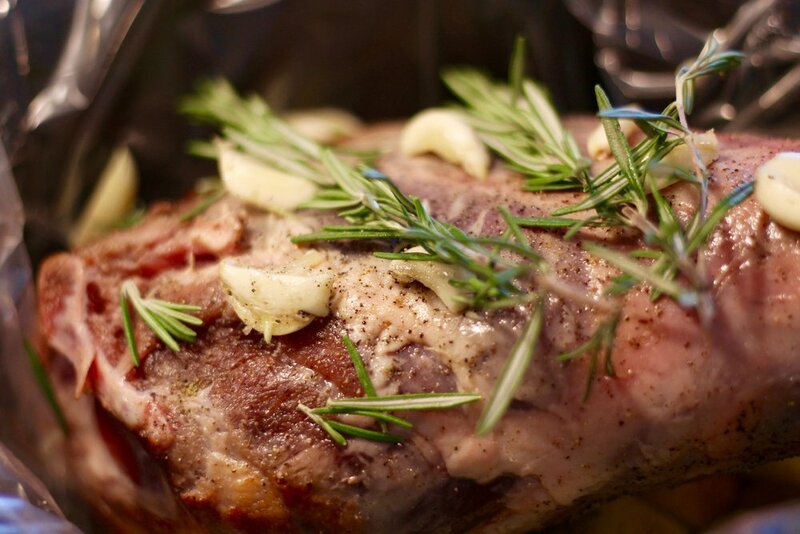 First up is this wickedly easy slow cooker leg of lamb with loads of garlic, rosemary and red wine - because everything tastes better with red wine. On paper, this dish sounds fancy AF and is sure to impress pretty much anyone you invite over, but it is so easy to throw together with the help of your slow cooker. Now look, if you don't have a slow cooker, I highly suggest you get one! They are dirt cheap, ranging from $30 - $100 (Amazon has some great selections here) and they legit last forever. Beginning my new shift work role has meant some pretty extreme schedule changes, which makes my slowcooker my best friend. Being able to toss in fresh ingredients, setting it to low, and getting to bed for my full 8 hours is invaluable and is the reason why a bunch of my recipes will involve this magical little machine. I hope you enjoy this delicious dish and I ask that you please tag me in any images if you try this recipe out! I would love to get your feedback!! In a bowl, mix together the EVOO (extra virgin olive oil), garlic salt, onion powder, salt and pepper. 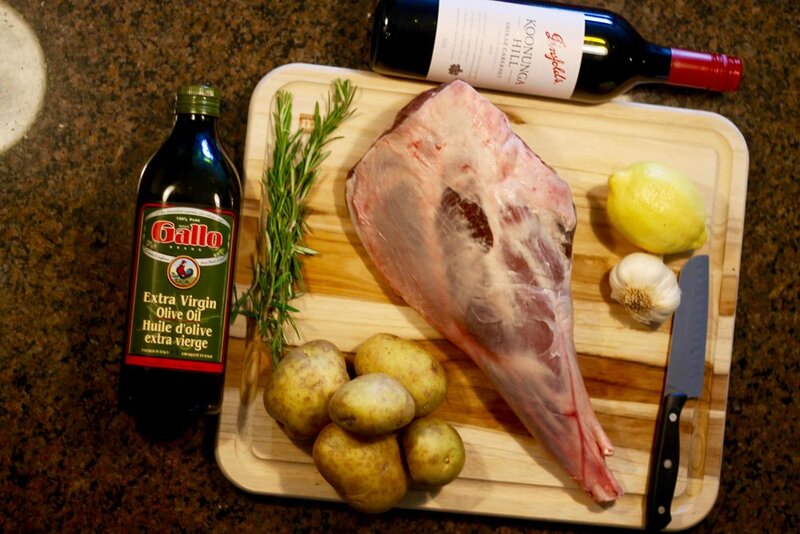 Rub the leg of lamb with this oil mixture and sear on all sides in a hot pan (if your leg of lamb is too large for the pan, you can play the leg of lamb on the centre rack of an oven set to broil on high for 5 minutes, turning every minute). 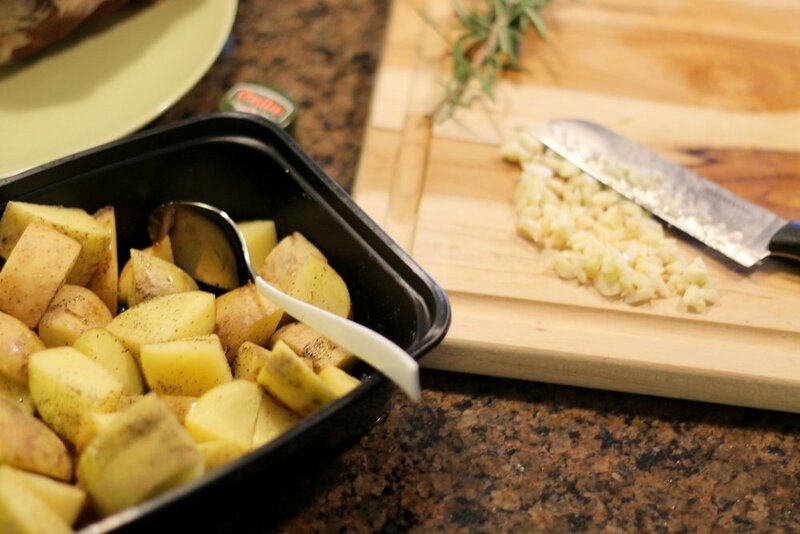 While your leg of lamb is getting acquainted to some heat, toss the cubed red potatoes and half the head of garlic together with a pinch of salt and pepper. Place them at the bottoms of your lined slow cooker (lining the slow cooker will help with clean up but this step can be skipped if you'd like). Add the browned leg of lamb to the slow cooker on top of the potatoes. 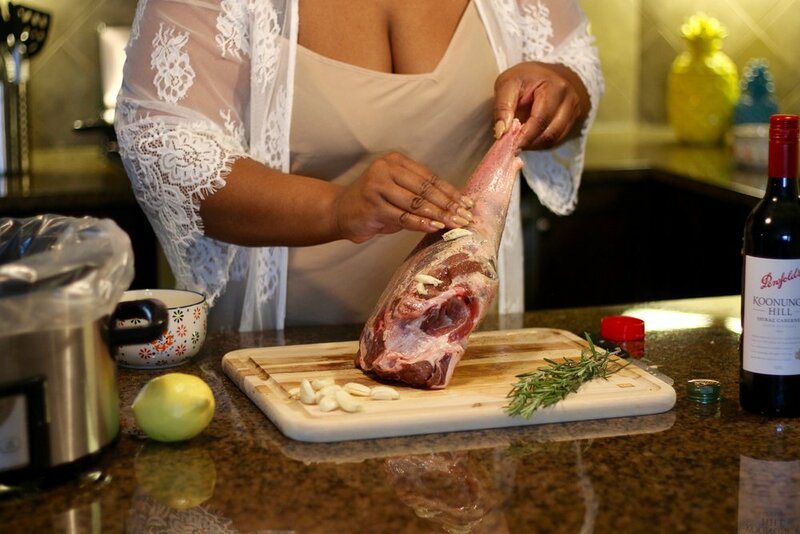 Squish the remaining cloves of garlic using the back of a knife and rub them over the leg of lamb. 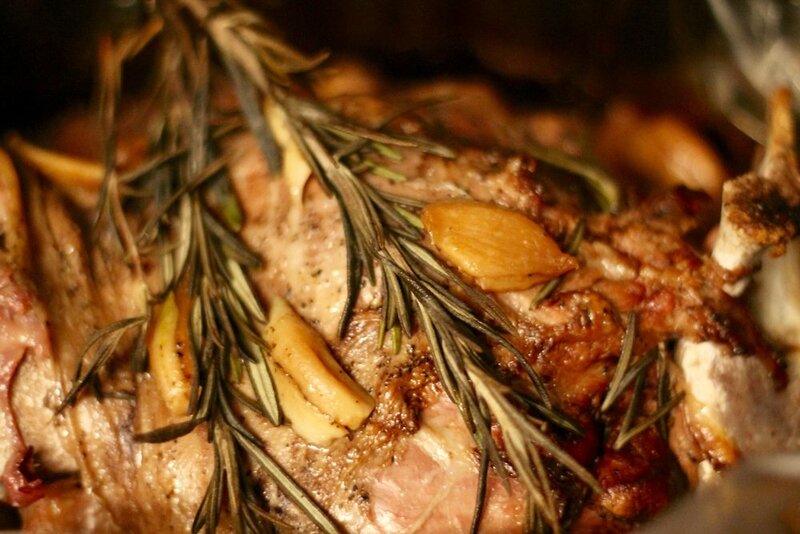 Sparkle with some salt if you wish and add the sprigs of rosemary on top of the lamb. Cover the slow cooker with the lid and secure tightly (if the bone of the leg of lamb sticks out, cover the entire lid and bone leg with foil to ensure that the heat stays in for the entire cooking period. Set the slow cooker to low for 6-8 hours depending on the size of the leg of lamb and strength of your slow cooker. Once the cooking time has completed, let the lamb sit for 10-20 minutes before carving and serving alongside the potatoes! There was so much delicious lamb juice at the bottom of the slow cooker that I did not want to waste. So I decided to make a quick lamb gravy. All you need to do is add the lamb jüs to a pan along with 2 tbsp of cornstarch (mixed previously with equal amounts of water) and a splash on the same redline utilized in this recipe. Simmer on medium-high for a few minutes, or until the gravy thickens. Add some salt and pepper to taste an voilà! The perfect gravy to pour over your lamb and potatoes! Enjoy! Thank you! Keep an eye on your inbox for updates on new blog posts, giveaways and more!